Print a Photo – How Hard Can It Be? 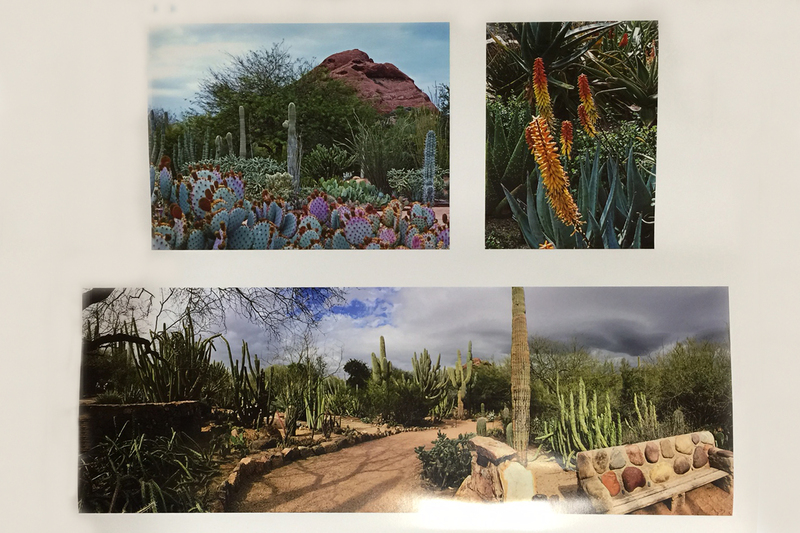 Our friend said that if we had some good photos from Arizona, he would use a couple to decorate his house. I was thrilled. I’ve always considered our photos as “office art” – the one that you may hang in your office and if it gets damaged or is stolen, you don’t really care. “Home” is a special place. Home deserves something much better. But I was excited for this opportunity, didn’t bother to tell him what I think. It didn’t take him long to pick 3 photos. 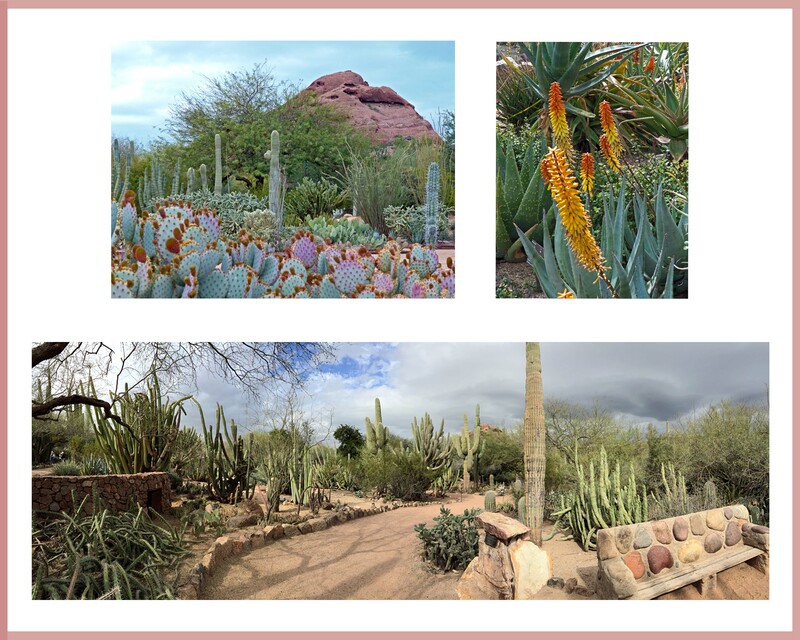 One of them is a panorama of the desert garden, which I took with iPhone. Would it be sharp enough when we enlarge the photo? To find out, I printed it at 16 by 20 at Sam’s club. It looked all right, I decided. I then used Photoshop to come up with the size and the composition that we all liked (printed several copies in between, of course). Two weeks later, I brought the photo to West Photo at Minneapolis (which is 2 hour drive) to print. The lady at the shop told me that it would print better if I increase the DPI (dots per inch) to at least 300, and their printer, actually, is able to print 320. My photo, sadly, has 72 DPI – the right amount for posting on the web or viewing on a PC monitor. She even showed me how to change DPI in Photoshop (using image-resize). I thanked her and took the photo home. I usually printed my photos at Sam’s Club. In my opinion, they do a very good job with 4 by 6, good enough job on 8 by 10 and OK job on 16 by 20. Once in a while I had to print the same photo again because the color didn’t turn out the way I liked, but most of the time, I was satisfied. Not to mention that their price is good. When I got home, I Googled and read about DPI, and increased the DPI of the photo to 320. I thought it was a good idea to try Sam’s first so I could compare this one with the 72 DPI one that I had printed there before. When uploaded photo at Sam’s, I received an error message… maybe because of the file size (the person who worked there couldn’t tell me why). I went home and made two copies of the same photo: one with 100 DPI, and the other 200. Sam’s machine was able to upload both. I printed the 200 DPI one. When I got the photo back, I was shocked. The photo was so dark that a lot of details were missing. Does increasing-DPI make photos darker? I Googled. The answer is “no”. Could it be the quality of the photo? Before giving up, I emailed Greg, who works at West Photo. I explained to him my problem and asked him if he had any suggestion for me. He asked me if I had calibrated my monitor for color (I remember Cee had mentioned this before). “I don’t think so,” I said. Back to Google again. After reading a couple of articles on calibrating monitor color, I emailed Greg: how about I’ll send you my photo and you tell me if I should print it or throw it away? Greg said sure. Wasting no time, I emailed him the photo, and a couple of minutes later, he told me the photo is good. My friend said he would buy the photo. I’m thinking… I probably should pay him for giving me such a wonderful learning opportunity. And… I have had so much fun! 36 Responses to Print a Photo – How Hard Can It Be? My goodness, Helen! Can I tell you how over my head this was? Did you see what I just posted pictures of? Bricks!! Haha! This is so advanced for me! But you sold your art to hang in someone’s home! That is so exciting! And the photos he selected are gorgeous. Happy day for Helen. Yes! I saw your brick photos. I think it’s harder to take a photo of bricks. I like your photos. My favorite is the first one. Good job, Helen. Yeah, calibrating monitor is very crucial. I am glad that West Photo delivers great service. Yeah they can be more expensive than Sam’s club but it’s so worth it. I am impressed and no way could I have learned all of that. Lovely photos. Very interesting issue you had with the printing company. I had the same issue…it really was something else (they printed off several decent sized pieces, quite spendy) and I had similar results. What they had done was alter the “exposure” on their printing setting (it automatically altered the exposures) ~ and then had the audacity to ask me “Oh, did you want us to print them without any alterations?! ?” I had to explain that I already made all the alterations. In my case, the company simply used their printing machines on automatic correction which “automatically update the settings” which for many snapshots may not be a problem, but can created huge issues were white or great contrast is needed/desired. I think you were right about how the print shop alters the “exposure”. The interesting thing is when I printed it in a smaller size, the print looked all right. I think it is a different printer when I print 16 by 20 and that printer must have a different auto-setting. West Photo sounds is great. The company I worked with in China was a bit painful and said that the machines that develop photos either calibrate automatically or the workers simply will calibrate to their tastes (and when you have white/wintery shots or high contrast, the results are not good). As far as calibrating computer screen, I’m with you, nothing to spend too much time worrying about 🙂 Cheers! Thanks, Mabel. You got it right that I’ve tried everything I could to make this picture perfect. After all, this may be my only chance to hang my photo at someone’s home. Ha. Helen, maybe you should explore getting an inkjet photo printer and do your own printing. Thanks, Hien. You are right! We do have an inkjet printer, but we don’t use it. I asked my husband why (We had used it before and there was a reason we stopped using it, but I forgot why.) He said because we didn’t print many photos and the ink dried up. Now that I started working on my 1000 photo project, I will print a lot more. We will start using it again. Thanks for your wonderful suggestion! You poor thing going through all of that. I wished you had just called me, I could have walked you through a bunch of stuff easily. Anyhow, I’ve had a professional printer at home for years. What I normally do to take away the darkness in the printed photo, is when I send it to print I brighten it. But then since I have a printer at home, I can play with it all I want. It also makes a different what kind of paper it is printed on. It’s not a simple thing to get a professional photo. You did well though. The photos are gorgeous. I’m not a photographer, but I would say you have a great talent. Keep working! I rarely print out a photo, but I had to learn about the dpi and all that when I was asked to provide photos for printing with a couple of magazine articles I sold. I do have a Canon inkjet printer at home now, and for most personal purposes, it does fine. I do use high quality photographic paper, and use the 300 dpi. It slurps up the ink, but since it’s an occasional thing, that’s ok. I can do fine up to 8×10, which is as big as I’ve ever wanted. Your photos are gorgeous. I’ve never been to Arizona, but one of my great hopes is to see a saguaro cactus. I’m easily pleased! Thank you for your comment. We have a Cannon inkjet printer too. For some reason, I thought it was expensive to use it. I just learned today that actually it is not that bad. I think I will start using it again. I have seen many saguaro cactus in Arizona. They look like people with arms stretching up 😉 Hope you will go there one of these days. I look forward to hearing how that goes! 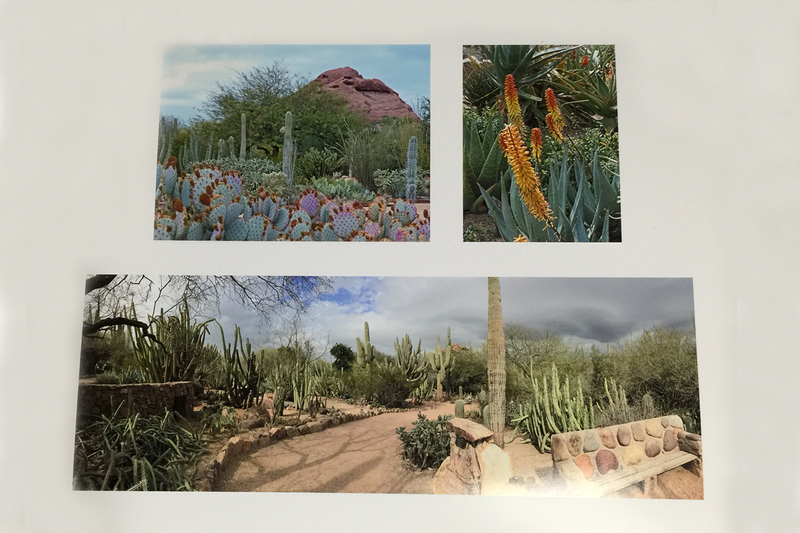 truly enjoyed hearing about this learning adventure – and your photos are gorgeous – I mean really nice selections of the arizona landscape – so beautiful…. …..and black and white printing is even more complex! Thanks, Anne. It sounds like I have a lot more to learn ;-( I will start googling! Thanks. There are a lot variables to printing, and I print my own up to A4 size, after a consulting a print master. Monitor calibration is critical, as is the background light in your room. Thanks, Lignum. You were right about the background light in the room. I have never thought of that.